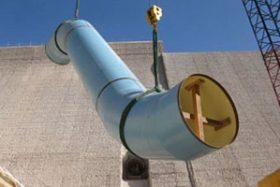 The San Diego County Water Authority’s Pipeline Relining program takes a proactive approach to pipeline maintenance. This 30-year program focuses on pipelines showing signs of deterioration and joint damage during internal pipeline inspections. The projects listed below consisted of the manufacture of 57,000 ft of 67 inch & 69 inch diameter welded steel liner inside pre-stressed concrete cylinder pipe. ON-SITE provided fabrication inspection, Welding Engineering support during installation and Phased Array Program Oversight support during the installation of the steel liners. 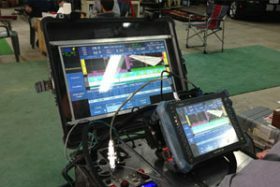 ON-SITE also assisted in the development of Phased Array Advanced Ultrasonic testing program, forensic analysis and root cause determination of material failure of steel during manufacturing processes. The Carlsbad Desalination project, when completed will be the largest desalination plant in the western hemisphere. The $922M project is the first large-scale desalination plant on the West Coast. The project includes a desalination plant, a pumping station, product water storage and a ten-mile product water conveyance pipeline. The plant will produce 50 million gallons of desalinated seawater (MGD) a day and provide ten percent of the total drinking water needed by San Diego. 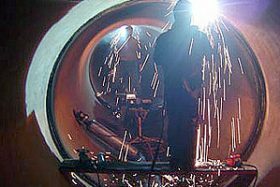 Factory inspection of the 50,000 lineal feet of 54” diameter heavy wall high pressure welded steel pipe and fittings occurred at several fabrication locations in both Southern and Northern California. Additionally 28,000 lineal feet of 67”-69” diameter of RCCP required steel relining at fabrication locations in Phoenix, AZ. ON-SITE provided field welding inspection services and NACE coating specialists during the installation of the large diameter steel pipe and fittings associated with this project. 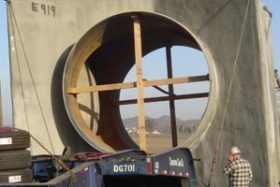 This project required QA verification and witness testing, welding, fabrication, painting and electrical workmanship reviewed by Water Authority inspectors during manufacturing and prior to shipment. ON-SITE’s inspection team has technical experts in the field of advanced ultrasonic testing and has assisted in the development of PAUT program on behalf of SDCWA Pipeline 3 Relining; Sweetwater to Lower Otay projects. This program was tailored for use on the reline projects and O&M warranty reviews. The ON-SITE team provided NDE forensic analysis of PAUT data collected; QA Program overview consisting of qualification of PAUT procedure qualifications, development of test standards, technician qualifications and project oversight during field welding. The design of this Factory-Built Flow Control Facility included an 11’- 6” W x 27’ L x 10’- 4” H below ground, steel capsule with connecting stairway structure. Major components included: two-20” Pratt Ball Valves, one-20” Full Form Venturi Flow Tube and one 20” VAG Plunger Valve with AUMA Electric Actuator along with the full electrical power, instrumentation and control system packages all built in Centralia, IL and sent to the site complete. The specifications were very detailed and the third party inspection requirements were stringent. All aspects of EFI’s QC testing, welding, fabrication, painting and electrical workmanship required QA verification and witness testing, reviewed by Water Authority inspectors during manufacturing and prior to shipment. Project site construction inspection was also performed by ON-SITE NACE inspectors performing verification of paint repairs that occurred during installation, DFT verification and holiday testing of the structure. 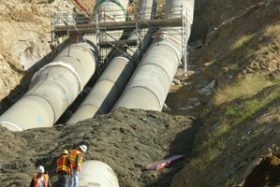 The San Vicente Dam Raise Project is just one of several projects that ON-SITE TECHNICAL SERVICES provided In Plant Fabrication inspection services and Construction Site support during a 4 year period. Project highlights included the Water Authority’s first Factory Built Flow Control Facility. Our management personnel and inspection teams provided Quality Assurance inspection during the construction of the San Vicente Dam Raise; Lakeside 1 FCF; Otay 14 FCF, Lake Hodges Projects; San Vicente Pump Station; Mission Trails Tunnel and Pipeline 3 SR 52 to Lake Murray Relining Projects. During the construction of these projects our managers were responsible for providing consultant Quality Assurance services in multiple shop and field locations throughout the United States and Overseas. The San Vicente Pump Station Projects are a part of San Diego County Water Authorities Emergency Storage project. The Pump Station was built to provide facilities for 3 horizontal centrifugal pumps, including 7000 HP motors, 2 variable frequency drives and transformers. The work being performed consisted of the construction of a new pump station, surge control facility and inlet-outlet structures, installation of fabricated steel pipe and fittings, and related systems, gates, valves, and other appurtenances. ON-SITE provided shop fabrication inspection services of the mechanical equipment and 5,000 ft of large diameter steel pipe and specialty fittings associated with this project at various locations both domestic and overseas in Japan, Germany, Brazil, China and Canada. Our Field welding inspectors supported the QA welding inspections during the installation of the pipelines and piping inside the pump house. ON-SITE provided field welding inspection services during the installation of the large diameter steel pipe and fittings associated with this project. Our fabrication inspectors completed inspections on the hydraulic turbines, generators, electrical equipment, control systems and large diameter valves at various locations both domestic and overseas in China, Brazil, and Canada. The Perris Valley Pipeline is a major water line that will provide substantial water reliability and quality benefits to a significant portion of Western Riverside County. The Metropolitan Water District of Southern California, Eastern Municipal Water District and Western Municipal Water District are developing the $80 million project jointly. When completed, the pipeline will enhance the treated water delivery capacity in Eastern and Western’s service areas by up to 150 million gallons per day. 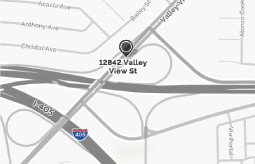 The Perris Valley Pipeline consists of 6.5 miles of 96-inch pipeline enhancing the delivery capabilities of the Henry J. Mills Water Treatment Plant. As an owner representative ON-SITE provided Field Welding QA inspection services. Our inspectors provided in process welding inspection during the fit up and installation of the 96 inch diameter pipe and fittings. 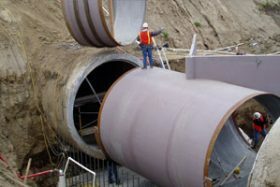 San Diego Pipeline 6 Northern Reach Project, which involves the construction of over 7 miles of 120″ Diameter pipe that will deliver water from the Colorado River to Riverside and San Diego counties. This $100 million project is a critical link in the regional water supply for this region. ON-SITE provided site welding inspection during the installation of the pipeline. Our inspectors also confirmed that the coating and lining repairs were completed in accordance with the job specifications. 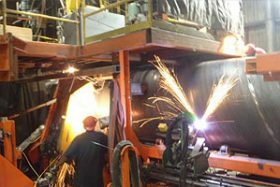 Prior to installing the pipe, our inspectors completed shop fabrication inspection services of over 7 miles of 120″ diameter steel pipe and fittings manufactured at several locations simultaneously throughout the United States. 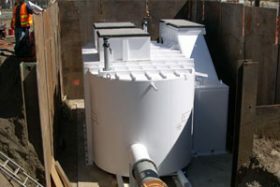 Our inspectors also performed inspection of the engineered equipment associated with this project, which includes the inspection of 42″ Check valves, 144″ Butterfly valve, various diameter high performance butterfly valves, flow meters and electrical instrumentation, at locations throughout the United States and Japan. 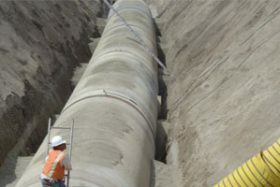 The Perris Valley Pipeline Southern Reach Project is the final phase of the Metropolitan Water District of Southern California, Eastern Municipal Water District and Western Municipal Water District $80 million project. When complete it will deliver up to 150 million gallons of treated water to Eastern MWD and Westerns WR service areas. 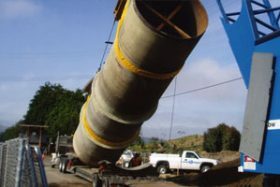 The pipeline required the installation of over 21,000 feet of 96-inch steel pipe. ON-SITE provided QA welding site inspection during the construction of the pipeline. ON-SITE’s inspector was an integral member of the MWD construction Management team. Coating and lining repairs were also inspected to confirm that they were in compliance with the job specifications.